In 2003, explorers daring enough to venture deep into the recesses of that oppressive structure known as Generic-Looking Game Boy Advance Puzzler Mountain came across a small treasure – a mix between Bust-A-Move and Arkanoid that proved about as fun as it was unexpected. Now comes its successor of the same name, Gem Smashers, but in the eight-year interim it's unfortunately lost quite a bit of its lustre. Many years ago, in a time forgotten by palaeontologists, our pointless story unfolds: you control one of three creatures who must save their friends from Imbu, an evil scientist who wants to capture all of them in crystal cells. You can pick between the fast but weak Bom, the strong but slow Bam or the well-rounded Bau, and proceed to bounce about a series of small stages, colliding with the titular gems to free your comrades. You continuously move forward and steer with the D-Pad or Circle Pad, dashing and slowing down with A and B. Colour swapping provides the twist – you must share the same hue with your target to smash it, and you switch by touching certain scattered blocks. You'll also avoid obstacles and collect power-ups, careening through breakable tiles to unearth some of them, before exiting once all of your companions are free. 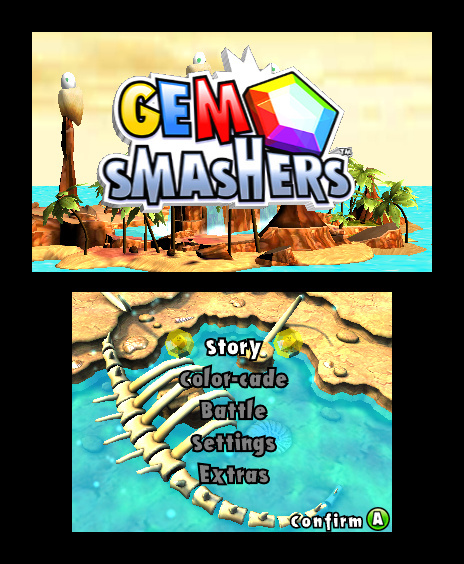 Story Mode sees you travel about a world map, playing through over 100 somewhat small stages, though these are larger than their GBA counterparts. 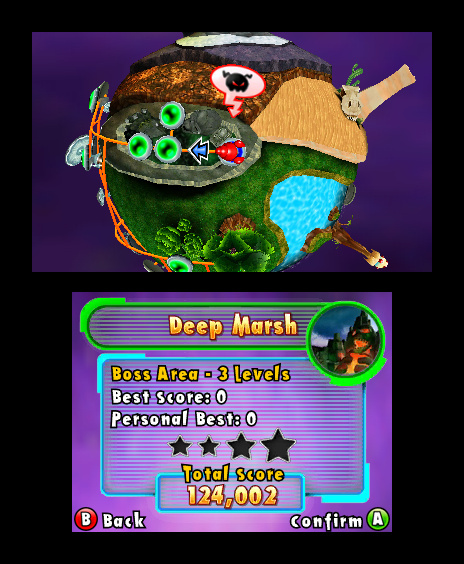 That cramped feeling formerly added to the challenge, and the wider space makes your character's progress feel a bit sluggish at times, but what really takes away from the difficulty is the almost complete lack of a penalty for your mistakes. While skull squares lie in wait, they'll only cause you to almost immediately re-spawn, points intact and lives a non-factor. Until level design picks up the slack in the last third of the game, this creates a sense of pointlessness that, for the most part, takes the fun right out of it. Those that stick it out will eventually face elements like switches, portals, coloured pushable blocks and strategically placed death squares that lend the levels enough complexity to make for a good time, but it's a long road getting there. Until then, the almost complete removal of stakes results in a tedious experience, and this goes double for the boss levels that bracket each section. It's quite disappointing as the implementation of lives or health, even as a non-mandatory option, would have performed wonders for this game, and in their absence, the strategic challenge of old becomes a boring smash-fest for quite an interval. Luckily, lives factor into Color-Cade Mode, which has you rotate around a pillar as you demolish your rocks. The levels are smaller and somewhat less complex here, and it's a pity that you can't start from a certain stage, but otherwise this can provide some enjoyable, fast-paced puzzle-solving action. 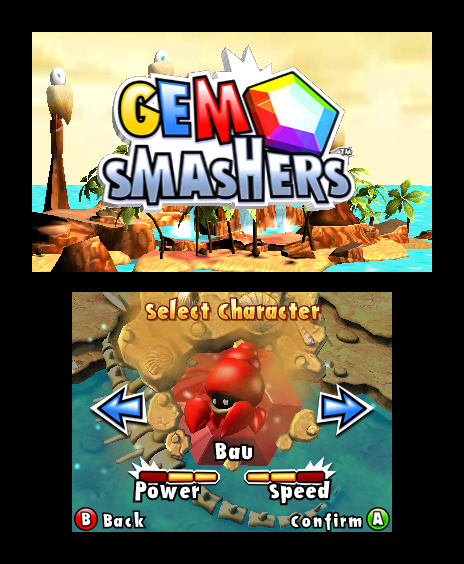 Multiplayer Battle Mode is a welcome addition as well, having you face off to see who can smash the most gems, though it's sadly multi-cart rather than Download Play. The backgrounds look great and the visuals on the whole are crisp and attractive, with the 3D assisting while never feeling like a substantial factor. The music isn't bad either, and overall the presentation is quite nice. You can unlock art as well, adding a bit of replay value. The fast-paced Color-Cade and some of the more complex later levels of Story Mode are quite entertaining, but the lack of lives in the game's main section makes the majority of its stages an extremely tedious affair. Those with the patience to tunnel deep enough will find an enjoyable experience, but overall, this gem is definitely a flawed one. 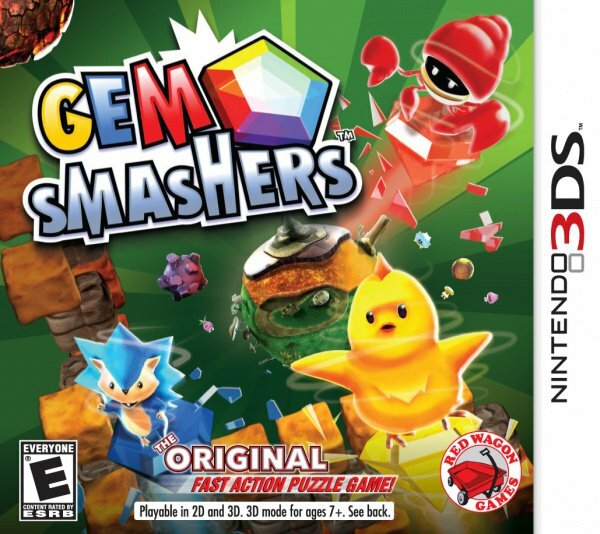 Gem Smashers? I've never heard of this... but whatever it is, I know I ain't picking it up. 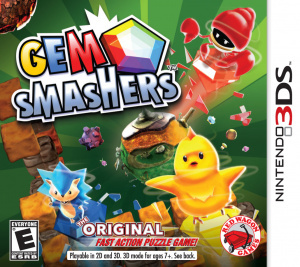 That blue thing on the cover totally looks like Sonic the Hedgehog. @tealovertoma - Well they do if you want a good spread of scores. Otherwise theres less room between scores. If 7/10 becomes average, then theres much less dividing 1-6 as review scores, and much difference in 8-10 scores. @4 Bah, quit your whining. A 5/10 is the perfect score for a flawed game. Rating systems don't have to average out. Unless you want your school to go back and fail half the people in your class. Sounds like an insta-download as a 3dsware even with a bit less content. As a retail purchase wouldn't even get it in the bargain bin tbh. Honestly, some of these games should just be 3DSWare. Nintendo should start only allowing the GOOD games be on disc or cart, and all games considered shovelware should be download-only. A cute/creepy Sonic The Hedehog, a tiny pink radish, and a star-shaped baby chicken, all on one piece of cover art? @4 Flawed = it has flaws. This altogether is an average game, as it's not without its positive and fun points like Color-Cade mode and some of the later story levels. I wouldn't call this shovel-ware for those reasons. agreed. it's not worth the full price that it is. Why is Sonic on the cover? I thought this was 3DSWare, not 3DS retail! I'm buying it since I was a huge fan of the GBA one.